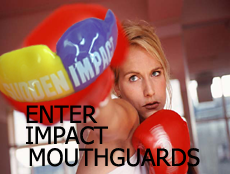 "IMPACT CUSTOM LAMINATED MOUTHGUARDS FOR ALL LEVELS OF PLAY"
MORE THAN 30 YEARS OF OF CUSTOM FITTED MOUTHGUARD RESEARCH AND DEVELOPMENT PUT'S THE IMPACT TEAM IN THE FORE FRONT OF CUSTOM LAMINATED MOUTHGUARDS IN TODAYS MARKET, NO MATTER WHAT SPORT YOU PLAY AND AT WHAT LEVEL YOU PLAY AT THERE IS A IMPACT CUSTOM LAMINATED MOUTHGUARD TO SUITE YOUR NEEDS . SO IMPROVE ON YOUR .. PERFORMANCE .. 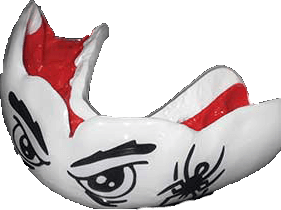 PLAY SAFE.......WEAR IMPACT CUSTOM LAMINATED MOUTHGUARD. "IMPACT ABSORBERS FOR YOUR TEETH"